I know, I know. I should read them. Everyone my age has read them. I’m missing countless references and the joy of a Harry Potter-filled life. But 7-year-old me couldn’t get past the second book and I’ve never returned. 2. A Series of Unfortunate Events by Lemony Snicket. For the record, I love this series. I want to read through them all again as an adult because I’ve forgotten so much and they’re filled with adult humor that I probably missed the first time around. I’ve read the whole series…except for the last half of the last book. I completely lost interest halfway through, and The End is the longest of the books. Oops. 3. Miss Peregrine’s Home For Peculiar Children by Ransom Riggs. Technically the third one isn’t out yet, but it will be later this month. I really liked the first book, but I struggled to get through Hollow City, and I don’t plan to pick up Library of Souls. I’m definitely interested in the Tim Burton movie based on the books though (expected release in 2016). 4. The Rat series by Haruki Murakami. Murakami’s trilogy of Hear the Wind Sing, Pinball 1973, and A Wild Sheep Chase is another series I don’t plan to finish. I read A Wild Sheep Chase–the most popular of the three–for school during senior year. It was interesting enough, but it was a bit too nonsensical for me. 5. The Ender Quintet by Orson Scott Card. I don’t like sci-fi, people. I just can’t get into it. I made it through Ender’s Game last summer, but this is another series that’ll go unfinished. 6. The Sisterhood of the Traveling Pants by Ann Brashares. This is such a throwback to the preteen years. I loved the Sisterhood of the Traveling Pants. I still remember reading it in the guest room of our old house and crying my eyes out over the character’s troubled relationships. I might’ve read the second book, too, but I definitely didn’t finish the series. Much love to Tibby, Lena, Bridget, and Carmen. 7. Stargirl by Jerry Spinelli. Here’s another throwback. I didn’t even know Stargirl had a sequel until I started scrolling through Goodreads to find book ideas for this post. I’d totally go back and read both books though–the first one was pretty formative for early teenage me. If I’m being honest, I’m not much of a series reader. I much prefer standalone books–they’re more gratifying to finish (because they’re done)–so 7 is as many as I can think of! What series have you started but have yet to finish? Harry Potter – everyone is hooked by book 3. It’s where the story takes off and my God what an amazing series of twists to move the story forward! Give Azkaban a go. If you don’t like that one, then give up. Ender – A shrewd move; the sequels are not a patch on the first one. The only one I would recommend reading is Ender’s Shadow which retells the first book from the POV of Bean. Not essential reading but it’s interesting to see opinions of and attitudes towards Ender Wiggin from an external source. I really SHOULD give HP another go. It’s such an icon of my generation. I had trouble coming up with ten for my TTT list this week, but I keep seeing entries on other people’s lists I could have used too! I haven’t finished Ender, A Series of Unfortunate Events, or Miss Peregrine’s Home for Peculiar Children. I just couldn’t finish The Mortal Instruments series. I actually really enjoyed the first one but the next two were terribly so mired down in the teen angst of disbelief and isolation that I just couldn’t go any further. I will say, Devon refused to read past book one of Harry Potter when she was seven, but picked it up this spring and ended up reading the entire series four times, declaring them the best books ever. I’ve heard really good things about the Mortal Instruments series! It’s all a matter of personal taste, I suppose. I prefer stand alone books, too. I haven’t started a series in ages and usually actually avoid a book if its in a series. Series are way too much of a commitment and I just have way too many other books I want to read that would be more gratifying for me. There are many things that make a good writer, of course, but I think one such testament to good writing is the ability to accomplish something with a set of characters and plot in the course of one book and not feel the need to return to them (that said, I always will have a soft spot for Harry Potter). It’s definitely a commitment–one I don’t feel like making so often! Personally, I think I like the first Harry Potter best, though books 3 – 5 had their charms. It might be interesting to re-read the series now that all of the books have been released, leading to a less disjointed reading experience. Do you think you will ever decide to try the series again? No judgment – just curious. I also was unaware that there is a sequel to Stargirl – interesting! 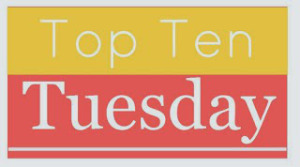 I also did a top ten post, but in general, I have trouble reading YA series in their entirety – they tend to lose steam around the second or third book, for me. I likely will try to read HP. Finding the time is tough, though–it’s a big commitment. The Maze Runner series. I really enjoyed the first book, thought the second was weird but pushed through, the third was better than the second, but I just never got through it. Put it down at some point and stopped caring if I finished or not. Also, I read Divergent and haven’t come close to picking up the next books in the series. And I really liked the book, I’m just tired of series. I haven’t read the books or seen the movies for Divergent. I definitely understand the “stopped caring if I finished” feeling! Not finished yet but I’ve only read the first of the Game of Thrones books. I also have yet to finish Hugh Howey’s Dust books. I haven’t read most of the series you mention but they sound good so I’ll be adding them to my Goodreads. Thank you for sharing. I’ve heard good things about GoT! Not sure if I’ll pick that one up. Thanks for visiting! I’m not much for series either. However, I did get hooked on HP and read each, cover to cover, within a couple of days, staying up all night if I had to! And I’m hooked on the Harry Bosch books which are coming to an end with the next one, I believe. And I also enjoy the Michael Bennett series by James Patterson. I love staying up all night to read! It’s one of the best feelings. I didn’t start reading Harry Potter until I was 18 (last year.) Best decision of my life. Each book is entertaining and beautiful in its own way. My favorite is probably The Deathly Hallows. HP is children’s literature at its finest. It’s good to hear a glowing recommendation from someone who experienced them later in life! I didn’t want to get sucked into the Potter mania; I resisted it for so long. But I was wrong. It’s worth it—every word, every sentence, every page, every chapter, all of it. I have a friend who we always says acts 40 sometimes and 5 other times…and he’s 20, so it averages out. Honestly I think my brain is just confused. I was born on leap day. I’m both 39 and 9 & 3/4! I actually read the very last of the Sisterhood books fairly recently — they’re all grown-up in it… I don’t think I would have enjoyed it as much when I was younger, but I really appreciated it when I read it (in my late 20’s). Hmm I didn’t realize they grew up that much at the end!! Harry potter…..you are not missing out on a lot there. I didn’t Unfortunate Events was a book! Your opinion on Harry Potter is certainly an uncommon one!! Everyone else questions how I could possibly live without reading the books.